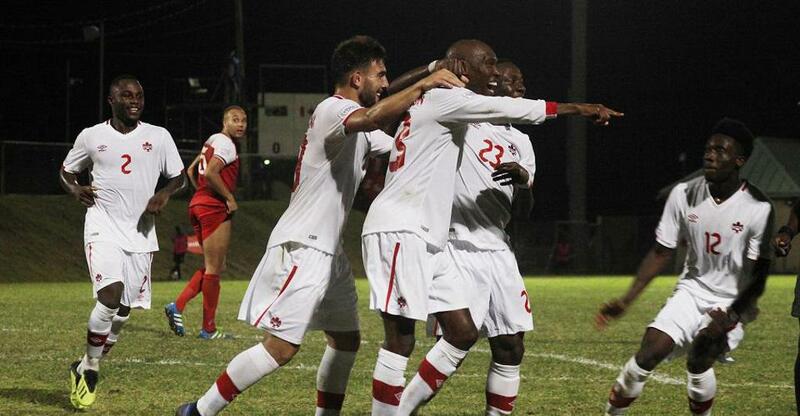 Canada Soccer’s Men’s National Team defeated St. Kitts and Nevis 1:0 on an Atiba Hutchinson first-half goal to stay within striking distance of first place in Concacaf Nations League Qualifying. A spot in the 2019 Gold Cup and a place in Group A of 2019-20 Concacaf Nations League is at stake with one match week remaining. With a clean sheet in their final game of 2018, Canada finishes the year with four clean sheets and a perfect 4-0 record. After Atiba Hutchinson intercepted a SKN pass and played through to Junior Hoilett, Hoilett’s ball wide to Russel Teibert allowed Teibert space to cross into a waiting Hutchinson who expertly headed the ball behind Julani Archibald (44’). An Alphonso Davies free kick from the top of the 18 after Junior Hoilett drew a foul was Canada’s best chance of the first half before Hutchinson made it 1:0. With Davies and Ballou Tabla over the ball, the left footed Davies hit the ball over the wall, but it continued rising too long and went over Archibald’s net. Hutchinson nearly made it 2:0 in the 56’ off a corner kick when he attempted to flick the ball past Archibald from a yard out who managed to make the save. The best chance of the second half for Canada came in the 85’ from a Davies strike at the top of the box after Jonathan David found space down the left side and passed the ball through to Davies. David himself had a chance in injury time but his shot off a headed corner from Russell Teibert went off the crossbar. Davies also forced one last brilliant save just seconds before the final whistle. Canada started Milan Borjan in goal; Alphonso Davies at left-back, Derek Cornelius and Doneil Henry at centre-back, Zachary Brault-Guillard at right-back; Ballou Tabla, Samuel Piette, Atiba Hutchinson, Junior Hoilett, Russell Teibert and Lucas Cavallini from midfield through attack. Head Coach Herdman replaced Tabla with Jonathan David (66’), Hoilett and Liam Millar (71’) and Cavallini with Cyle Larin (74’). Amongst 34 qualifying nations, Canada are in second place with a +14 goal difference after the 1:0 victory, an away 8:0 win over US Virgin Islands and a home 5:0 win over Dominica. With three wins and 14 goals in Concacaf Nations League Canada are tied for second place with Cuba (+14) behind leaders Haiti (+15) and just ahead of Jamaica (+11) all on nine points through three matches. Curaçao and Martinique each sit at 6 points through two games with matches remaining on 19 and 20 November. Canada’s next generation has also shown plenty of promise through the competition thus far. Jonathan David of KAA Gent in Belgium scored three goals and two assists in the first two matches while Alphonso Davies, now of FC Bayern München in Germany, recorded four assists. Canada’s other teenagers with big European clubs are Zachary Brault-Guillard of Olympique Lyonnais, Liam Millar of Liverpool, and Ballou Tabla of FC Barcelona. While Davies made his international debut in 2017, the other four have all made their debuts in 2018. Along with Alessandro Busti (Juventus), this marks the first time since 1984 that Canada has debuted five teenagers at the international “A” level in the same calendar year. Other youngsters still 21 or younger are Derek Cornelius of FK Javor Ivanjica (Serbia), Liam Fraser of Toronto FC, and Marcus Godinho of Heart of Midlothian (Scotland). Shamit Shome of Impact de Montréal also made the trip to St. Kitts & Nevis as a training player to ensure more top youth players are gaining experience in the Men’s National Team environment. The qualifying campaign runs through March 2019, after which the top nations will be ranked on points (three points for a win, one point for a draw), goal difference, goals scored, away goals, and then fewest yellow/red cards accumulated. The top six teams will qualify for League A in 2019-20 Conacacf Nations League, and the top ten teams will qualify for the 2019 Concacaf Gold Cup. Canada will face French Guiana at home to close out the Qualifying Round on 26 March. The 18 November match against St. Kitts and Nevis was the third all-time meeting between the two nations, with Canada having won a 2011 home match 4:0,and drawing 0:0 away at Warner Park in FIFA World Cup™ Qualifiers. In 2018-19 Concacaf Nations League Qualifying, St. Kitts and Nevis won their home match 1:0 over Puerto Rico in September and then their away match 10:0 over Saint Martin in October.